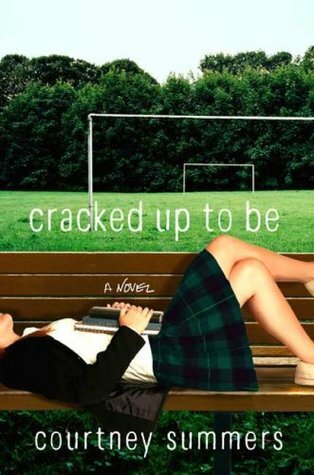 Last semester in English class, Cracked Up to Be was one of the options of books to read for a culminating project. As much as I wanted to read it, I ended up picking Paper Valentine instead, but I still knew that I would pick up this book sometime. I love stories about high schoolers, so I predicted that this would be a winner. In some ways, this book was a winner, but for others? Not so much. I really enjoyed my time reading this story, but there were some things that I wish were explored more or improved. This book follows a girl named Parker who is a senior in high school. She is just about to graduate, but the happy straight-A student and cheerleader she used to be has gone AWOL and has been replaced by a depressed, moody girl who fails her classes and starts drinking. The people who care about her are all very worried and want her to feel more at ease, but she refuses any help offered to her. But what no one knows is that Parker has a secret- she may be the one who is to be blamed for a tragedy. As you’d expect from reading the synopsis, Parker was quite whiny and complained a lot. The fact that she refused any help that came her way bothered me a bit, and I really wanted to shake her at times. As Parker slowly became more and more tolerant, I loved the development she went through in re-becoming the gregarious girl she used to be, even if she wasn’t fully restored yet. This is for sure a character-oriented book. The way I know this is because the plot isn’t too developed, and the whole storyline revolves around Parker and her development. This isn’t a bad thing at all, but I would have loved to see some more memorable events. Despite the plot being somewhat bland, I was still kept on the edge of my seat, dying to know what happened to Parker as well as more about her circumstances. Isn’t it interesting how a book with a dull plot can still hook you in? Also, I have one more tiny, super nit-picky complaint- there was an animal death in this story. I absolutely hate those, they’re so sad, and honestly, they are worse to deal with in literature for me than human deaths. Animal lovers, just be warned!